With one of the world's most spectacular playgrounds right in our backyard, we know that many visitors to Denver like to add a Colorado mountain visit to their trip, either at the beginning or the end. That&apos;s it - leave the rest to us! For more information about this program, please contact your convention services manager. 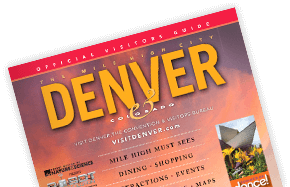 Use the VISIT DENVER Digital Marketing Kit to promote your Denver meeting, tradeshow, conference or event. Find postcards, ads, emails, copy and more! Marketing Denver to your meeting attendees and groups has never been easier. Order items such as promotional brochures, photos and pins.